From launching heli-skiing in Alaska to helping popularize backcountry skiing and revolutionizing its gear, Coombs left an indelible mark on the sport, and the plaque is an apt tribute to a man whose contributions continue to reverberate throughout the ski world. Born in Bedford, Mass., Coombs grew up skiing at Nashoba Valley, Mass., and honed his steep-skiing techniques at Bridger Bowl, Mont., before moving to Jackson Hole, Wyo., in 1984. There, he emerged as one of the pre-eminent skiers of his generation. Drawn by Alaska’s steep Chugach Mountains and deep snowpack, in 1994 Coombs opened Valdez Heli-Ski Guides, one of Alaska’s first guided heli-skiing operations, where clients are flown to the top of mountains to ski or snowboard untouched powder fields. The move transformed Alaska into a mecca for extreme skiing. Today it is home to 15 heli-ski operations, the most of any state, and heli-skiing there is considered one of skiing’s bucket list experiences. “Doug Coombs opened up Alaska to heli-skiing 100 percent,” said Kevin Quinn, president of the Heli-Ski U.S. Association. In the United States, heli-skiing is a $20 million industry, up from $5 million in 2006, Quinn said. But it was Coombs’s dust-up with the Jackson Hole ski patrol in 1997 that helped lead to policy changes across the ski industry. A Jackson Hole Mountain Resort ski patroller caught Coombs skiing in a closed area within the resort’s boundaries, after having been caught skiing out of bounds several times before. The resort revoked his skiing privileges. In response, Coombs moved to La Grave, a ski area without marked runs, avalanche control, groomed slopes or boundary ropes. The incident ignited a firestorm over ski-resort boundary policies. On one side were powder lovers, who were willing to accept the risks — namely avalanches and unmarked hazards — inherent in skiing out of bounds and who believed they should be allowed to use the public lands that are adjacent to many resorts. On the other side were the ski resorts, who were trying to enforce their boundaries and keep skiers safe. They did not want to be responsible for accidents that occurred outside their ropes but on terrain accessible from the ski area. Two years later, thanks in part to the Coombs incident, Jackson Hole became one of the first resorts in the United States to revise its policy and open its boundary gates. “When Doug got kicked out of Jackson Hole, the publicity surrounding his activities helped popularize side-country skiing and usher in an era of open gates policies,” said Seth Masia, president of the International Skiing History Association. Today, there are over 50 resorts in the United States that allow skiers to access out-of-bounds terrain from the ski area. Jackson Hole’s 3,000 acres of lift-accessed backcountry skiing, also known as side-country terrain, is one of its key selling points, according to Anna Cole, a spokeswoman for Jackson Hole Mountain Resort. Skiing and snowboarding off the trail in lift-served areas is one of the fastest-growing parts of the sport, according to SnowSports Industries America. From 2009 to 2015, participation in resort backcountry skiing and snowboarding increased 58 percent. The rise in backcountry participation has been helped by innovations in equipment, in particular the fat ski, with its wider planks that facilitate skiing powder. Coombs was instrumental in the fat ski’s development. 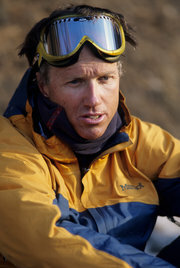 “Along with Shane McConkey, Doug was in that same league of people who were pioneers of fat ski development and wanted to have a tool that would allow them to have more fun in the mountains,” said Tim Petrick, the former president and chief executive of K2 Sports, referring to another skier, who died in 2009. It was Coombs’s love for untamed skiing that ultimately led to his demise. On April 3, 2006, at the age of 48, Coombs and three friends skied down the Polichinelle couloir, a cliff-rimmed run in La Grave. 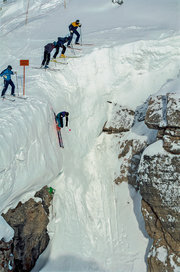 As the group descended the couloir, Chad VanderHam, 31, an aspiring mounting guide, slipped off a 490-foot cliff. As Coombs peered over the precipice, trying to help his friend, he fell to his death. The loss of both men in a freak accident — in particular Coombs, one of its most beloved heroes and most charismatic stars — stunned the ski world. Coombs lives on through his contributions to the sport and through the Doug Coombs Foundation, a nonprofit organization started in 2013 by his widow, Emily. The foundation provides low- income children from Jackson Hole with the resources required to learn to ski, including weekly lessons, equipment and lift tickets.